The claim by Minister of Information and Culture, Lai Mohammed, that government spends about N3.5million monthly to feed the detained leader of the Islamic Movement of Nigeria (IMN), Ibrahim El-zakzaky, on Thursday drew derision from leaders of the Peoples Democratic Party (PDP) and other Nigerian commentators. Mr. El-Zakzaky who has has been in detention since 2015 was again on Wednesday denied bail by a court in Kaduna. In a video which has gone viral and also reported by PREMIUM TIMES earlier Thursday, Mr Mohammed while making the claim told journalists he was speaking off record. 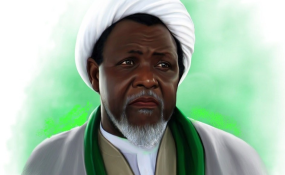 "The issue of whether, where he (Mr El-Zakzaky) is, at least let's keep it off record, that he is in a residence and you know eating at the... It costs the government about N3.5 million every month to feed him. Honestly, don't quote me, but these are the facts", the minister said in the video. Reacting to this claim, Ben Murray-Bruce, a senator, said if the president could spend such amount on Mr El-zakzaky, minimum wage of N30,000 should not be a problem. "If President @MBuhari can afford N3.5 million per month to feed Ibrahim El Zakzaky, then I don't see why he can't find afford N30,000 per month to pay the new minimum wage. Or should Nigerian workers join Zakzaky in detention so they can feed at N116,000 a day too? ", he tweeted. Also, a former aide to ex-President Goodluck Jonathan, Reno Omokri, wrote on his Twitter handle, "‏N3.5 million a month is N116,000 a day. Where did @MBuhari find this monumental LIAR from? They should change his title to Minister of misinformation and national disorientation." "How can President @MBuhari feed only one man, Ibrahim El Zakzaky, with N3.5 million and expect a worker with a wife and children to feed his family with N18,000 per month? This is an insult to Nigerian workers. I wonder how much Buhari is feeding Dasuki with!" Other Nigerians also commented on Twitter. "Lai Mohammed will start a statement with "Honestly" and end it with a Lie that will shock the Devil", @ UmehOMA wrote. It costs FG N3.5m to feed ElZakzaky for a month." - Lai Mohammed, Minister of Information & Culture. These people don't rate us." @PhilipsSunday wrote: "Lai Mohammed's claim means Sheikh Ibrahim El-Zakzaky is eating "gold, diamond and silver spiced with lion, elephant and whale" to be able to consume a whopping N3.5m monthly." @adaezemonique wrote : "FG Spends N3.5m Monthly To Feed Ibrahim El- Zakzaky" - Lai Mohammed. That means El-Zakzaky eats N112,903 meal a day. The facial expression the Devil gives whenever Lai Mohammed opens his mouth to talk."